The size of your toiletry bag is of the utmost importance. It needs to be compact but deep enough to allow adequate storage. A toiletry bag doesn’t always need to take up a lot of space but it does need to feature practical design aspects with great compartments. Given the limits of your carry-on space, a good toiletry bag shouldn’t really measure more than 8 to 12 inches long by about 4 to 6 inches wide. Depth, is up to you. 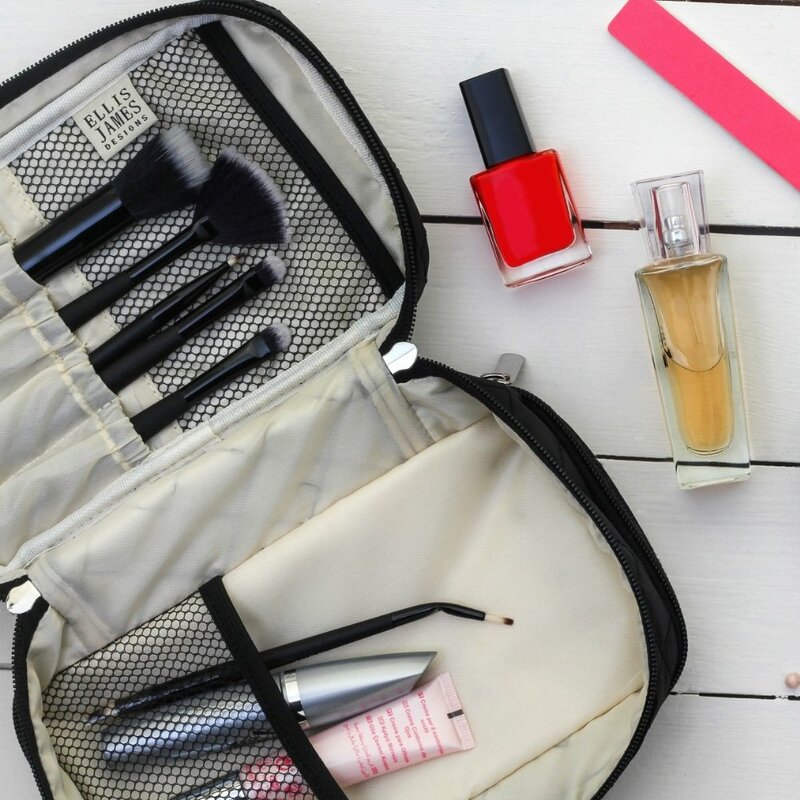 Remember that you’ll most likely be storing more than just makeup in your toiletry bag. Look for features such as necklace straps and storage compartments for rings, bracelets, watches and earrings. Factor in the size of your average equipment such as brushes, nail files, perfume, nail polish, and make sure that there is enough space to hold a good selection of products. Your travel cosmetics should have more than enough sorting space for the basics. 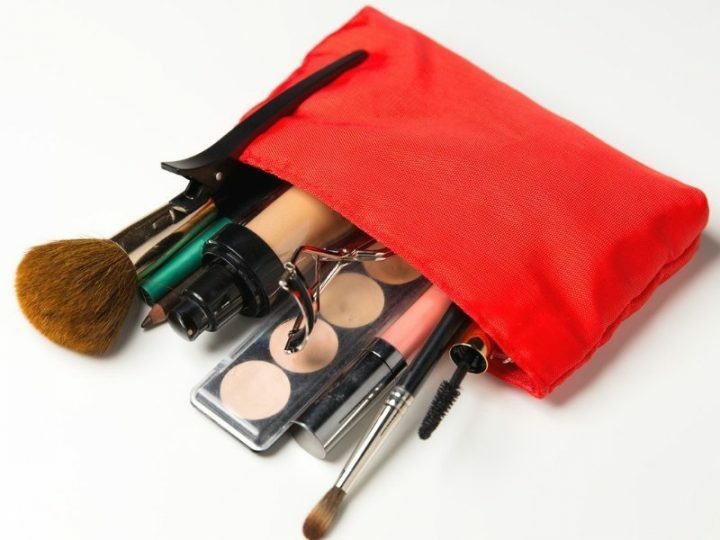 Pouches for brushes are essential and mesh compartments are a must. Your toiletry bag is going to be carried around with you which means that it needs to be durable. Stitching quality and padding must be of a high quality, while the material used should be durable and stylish. Get a toiletry bag with enough padding and protection and you’ll be able to squash it flat without worrying about your cosmetics and toiletries getting damaged. The overall look of your toiletry bag for carry-on luggage is very important. It’ll be with you during your travels, seen as a part of your look. Buy something stylish yet functional. The upside to a designer toiletry bag is far more than a stylish appearance. Quality craftsmanship also means that your goods are protected while you look your best. You’re guaranteed that the bag will last thanks to the premier manufacturing. A high-quality travel toiletry bag can even be used at home as a stylish addition to your bathroom if you buy the right one. The best toiletry bags for a carry-on. Each bag gives excellent storage space, outstanding value for money, and a stylish design that you can take anywhere. This 2-in-1 jewelry and makeup bag is the ideal travel solution. Within its compact 9.25 x 6 x 3.5-inch space, you find a massive amount of well sorted space. The Ellis James Designs Black Jewelry & Makeup Bag gives you two zippered pocked, two large storage compartments, five pouches for makeup brushes, multiple necklace straps, and pouches for your rings, bracelets, watches and earrings. It is well-padded and is made from quilted nylon which is soft to the touch. Zipper quality is outstanding and the entire design oozes style. It’s the best toiletry bag for carry-on luggage for those traveling for a week or less. If you travel frequently and are looking for a way to carry all of your cosmetics with you, try this large Tall Cosmetic Bag from Ellis James Designs. The Ellis James Designs Black Tall Cosmetic Bag measures 10.25 inches wide by 7.25 inches long and it has a depth of 7 inches. There is more than enough space to stand tall bottles upright. Just like all Ellis James Designs products, it is made from soft-touch quilted nylon. The space inside is extremely well organized, giving you brush holders, netted pockets, and discrete zippered storage. The quality is sure to last you a lifetime and as with all Ellis James Designs, the look is timeless. A good-quality toiletry and cosmetics bag is sure to last you for many years. Make sure that you buy something that not only functions well, giving excellent organizational capabilities and storage space, but also something that looks great. Never compromise on any aspect of design. There are winning solutions available for all types of customers carrying any volume of cosmetics and skincare products.